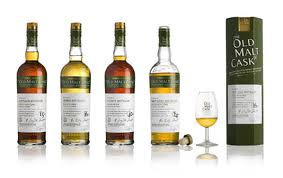 It is around 7 pm on Thursday the 9th of June and both the Whisky Boys are especially glad to have three guest tasters who are not new to good Whisky but are about to get there first tutored tastings. Stewart Coull, a retired educationalist and raconteur. Stewart hails originally from Northern Ireland so you may expect Guinness to be his chosen tipple but a Scottish father ensured that an appreciation for Whisky was well nurtured. He is married to Helen and has a son and daughter in whom he is well pleased. As a secondary teacher Stewart worked in Learning Support but took early retirement to focus on a career in after dinner speaking. A well kent face on the after dinner circuit, Stewart continues to be a fan of the finer things in life, not least of all ‘a wee half’. Helen Coull, retired English teacher. Northern Ireland was Helen’s home too before she met and married Stewart and sailed across the Irish Sea to set up home in Airdrie. Having moved to Cumbernauld and having taken time off to raise her children, Helen returned to teaching and spent many happy years as APT English at Caldervale High School in Airdrie. She has now retired and spends her days working in her son’s café and catching up with the housework, walking the dog and enjoying her grandchildren. Gary Sibley, IT Account Manager. Gary moved to Scotland 15 years ago from Crawley in England and has made his home here. Dad to three boys and stepdad to a boy and a girl, Gary’s days are never empty. He’s a keen cricket, boxing and football fan. He’s a relative newcomer to the world of Whisky but is nothing if not enthusiastic. Our first two drams were sent to the Whisky Boys from our friends down at Richmond Towers in London, (the PR agency for Chivas Brothers) several months ago, but it is now that we have decided to do a tasting with our three guests that we have been trying to get dates that suited everyone. Now let the tastings begin. First up tonight is the Speyside dram from the grand old Strathisla Distillery. Strathisla Distillery home to the world’s most iconic premium blended Scotch Whisky, Chivas Regal. 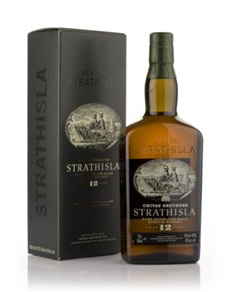 The product range includes Strathisla 12 Year Old, Chivas Regal 12 Year Old and 18 Year Old, Royal Salute 21 Year Old, 100 Cask and 38 Year Old Stone of Destiny and the very popular Cask Strength Edition. Nose…Caramel and sultanas soaked overnight. Taste…Creamy soft and smooth, caramel and chocolate butterkist. Finish…Soft and medium, very buttery. Taste…Elegant, smooth and a little drying. Finish…Medium finish but with fruit still evident. Finish…Medium finish, with a hint of vanilla. Nose…Fresh with a little wood. Finish…Medium finish, a very nice dram. Nose…Fresh lots of fruit and maybe the ever so slightest hint of smoke. Taste…Drying but with loads of toffee and puff candy with a wee hint of sherry. Finish…Medium to long with some spices showing. This our first tasting went down very well everyone really enjoyed this elegant dram and it is no wonder that it is the backbone of Chivas Regal and Royal Salute. Now for number two of the evening, a dram from the Longmorn Distillery. Built on the site of an old chapel, the Longmorn Distillery has been founded by John Duff and two associates, Charles Shirres and George Thomson in 1894, together with its neighbour Benriach Distillery. John Duff founded the Glenlossie Distillery 19 years earlier. This dram is contained within a bottle that boasts a metal collar and a base made from leather, really great looking bottle. Nose…Peppery sugar, but grassy notes. Taste…Very smooth and very rich. Taste…A sweet sharpness, stewed sweet rhubarb. Finish…Long, really enjoyed this one. Nose..Sweet and creamy hint of apples. Taste…Butter and honey, a little wooded spice quite a silky dram . Finish…Long and near the end in comes a bit of pepper and some nuts. This one everyone agreed was a robust, full on fiery dram, this is one that Jim would love to have in is cabinet at all times. Our third and final tasting of the evening comes from a great independent bottler, Douglas Laing and it is a Glenlivet. An Old Malt Cask Bottling by Douglas Laing & Co Ltd. Glasgow. Distilled in April 1980 and bottled in April 2007. One of only 277 bottles. When you link an iconic name in the world of Whisky and that of a great independent bottler then you can only expect the very best. Taste…Soft melted chocolate, galaxy, ultra smooth perfume still in there. Finish…Medium finish but a beautiful soft dram. Finish…Medium finish a delightful dram. Taste…Sweet fruit and exceptionally smooth. Finish…Medium and the best yet. 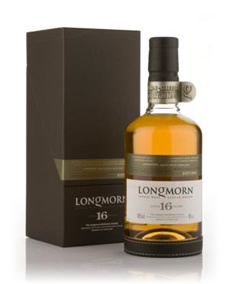 Taste…Butter shortcake, very clean on the palate, a bit of vanilla, a remarkable dram. Finish…Medium finish but so clean and fresh, top my glass up again. As stated earlier well done to all at Glenlivet and Douglas Laing, you have produced a fabulous dram. All at the tasting table loved this evenings selection of drams with the winner being the Glenlivet, but in saying that there were certainly no losers. The first two drams of the evening are readily available at your specialist Whisky shop and can be bought using the window below. The Glenlivet however is extremely hard to find, even on-line. So if anyone out there comes across a bottle then they should snap it up, we estimate the price to be around the £100.00 mark. 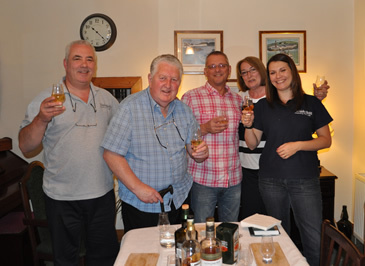 All our guests left with a glow and a warm feeling, and said if we were short of a taster or two then they would like to be first reserve, the Whisky Boys said yes of course.